Americans are now so involved in stocks that the value of investments in the market exceeds investments in our homes. Instead of relying on pensions and Social Security, baby boomers depend on investing for a secure retirement. And investing is cheaper and easier than ever before. But in the past five years, just as investing prowess has become essential, the rules of the game seem to have changed. How can investors safely and confidently play the markets when even George Soros and Warren Buffett admit they're at a loss? In chapters written exclusively and originally for this book, Gretchen Morgenson, Floyd Norris and other top markets correspondents of The New York Times offer today's smartest thinking on money and markets, helping readers chart investment strategies that will outlast the market's inevitable booms and slumps. They detail the changes in the market--and the opportunities and risks that await investors. They help the reader assess investment strategies based on goals, career, and stage in life as well as the shifting economy. And they provide indispensable analysis and tools for picking stocks, mutual funds, bonds, and international investments--including advice for limiting tax bills, one of the easiest, lowest-cost ways to improve investments. 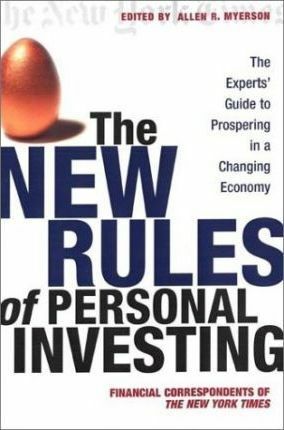 The New Rules of Personal Investing is the expert source demystifying the market for successful and intelligent financial management in the new economy.